I discovered the Braque Francais breed several years ago in a Gun Dog magazine. I noticed what I thought was a good looking GSP on the cover and picked up the magazine. I then saw the breed of the dog was something called Braque Francais and proceeded to flip to the article and read it while standing in the store. I then purchased the magazine, took it home to Jeff and with it opened to the article I handed it to Jeff saying "I want one of these!". I have always admired the look of the GSP, but didn't care for their larger size. I thought "this makes the Braque Francais perfect ! I can get the color of a GSP in a Vizsla size" ! A year + later we were proud Braque Francais owner's. We love them! But the Braque Francais breed is so much more than the look of a GSP in a smaller package ! We refer to them as "a Vizsla of another color". Above, is Jean (our oldest Braque female) with Carlee. Please visit our Facebook page, "Wingshot Kennels". . click on photos.... look for an album titled 'our adult dogs' . You can see Buddy, the younger Braque male, and all of the Braque females. Notes from Jeff: about Hunting "In years gone by the foot hunter was forced to work dogs that had been bred for hundreds of years to run big, namely English Setters & Pointers, and break them down into a medium ranging dog in order to have a hunting companion that had sufficient drive, stamina, intensity, and enough general bird finding ability to be called “a good bird dog”. There are many predictable problems that are inherent with doing this; the frequent missing dog that is genetically predisposed to extreme ranging leaving you to wait for his return 15 minutes later. And of course the dog that won’t retrieve unless force broken. And then the occasional dog who won’t get in the water under any circumstances. Problem solved: Braque Francais. Now don’t get me wrong, there are many Setters & Pointers that make outstanding foot hunting dogs. I have owned many extraordinary Setters myself and still have 1 English Setter, but there are other choices and personally I believe a much better choice is the Braque Francais. Many of us have conceded that in some parts of the country if we want to bird hunt, preserve hunting is all we have available. It is simply the only game in town. As a hunter who has been guiding at a number of these preserves for more years than I care to admit, the best dog for this type of hunting is without question the Braque Francais. During my lifetime I’ve been involved with training most of the popular hunting breeds there are but I’ve never seen dogs as easy to train as a Braque Francais." The Braque Francais (which translates to French Pointer in English) is one of the most ancient breeds of pointing dogs. The Braque Francais is a direct descendant of the very first pointing dog, the Spanish Pointer. The Braque Francais first became established in the Pyrenees Mountains of southern France. The first Braque Francais in North America were imported to Canada from France in the 1970’s. By the late 1980's, a few dogs found their way into the United States. They are now well-known in France and other parts of Europe, and are promoted by pointing dog enthusiasts in Canada and the U.S. The popularity of the Braque Francais in the U.S. continues to grow each year. Most of the pointing dogs of Europe can trace their lineage to a pointing dog that was first recognized in the 14th century. The original Braque Francais type of pointing dog has existed since the fifteenth century. By the 17th century, that breed had evolved into the “old style Braque Francais”, which is the ancestor to nearly all of the French pointing breeds. Local variations emerged from the old style French Pointer over time, and these breeds were often named for localities in which they were developed and each new breed took on the name of it‘s province. But the old style Braque Francais continued to live in it's pure state in a southern portion of France and the Central Pyrenees region. The breed not only contributed to all of the French pointing breeds, but also contributed to all of the shorthaired dogs of Continental Europe. In the late 1800’s the breed as we know it today began to develop. By breeding the old-style large dogs with smaller shorthaired pointing dogs, a smaller Braque Francais was produced in the Pyrenees region, just north of the Spanish border. There are two types of Braque Francais, both from the south of France — the Gascogne, Braque Francais De Grande Taille (larger); and the Pyrénées, Braque Francais, De Petite Taille - petite taille (smaller). The Pyrénées is a smaller dog than the Gascogne. The more common of the two is the Pyrénées, standing at 18-23 inches and weighing 39-53 lbs. The female is usually smaller than the male. There are 2 primary traits that make Braque Francais-Pyrenees highly desirable in the home; their calm, quiet easy going temperament and their size. The Braque Francais personality is considered to be submissive, friendly, very sociable, gentle, affectionate and loyal to it‘s family. He is very intelligent but sensitive so positive reinforcement training definitely does better for the Braque Francais than harsh methods. Socialization and mental stimulation are recommended for this breed in order to have a great companion and family member. Temperament of individual dogs can vary, and all puppies should be well socialized with people and other animals at an early age. The Braque Francais needs to spend a lot of time outside getting exercise daily if possible. A large fenced-in yard is adequate but a larger area to run is desirable occasionally . A happy Braque Francais needs to be well loved and given lots of exercise. The Braque Francais is a perfect choice for the novice or experienced hunter who intends for his dog to be the family pet and a hunting dog. The dog has been described as a “couch potato” who really comes alive in the field. Pyrénées-types are spirited, impetuous and fast on the ground. In the field, what makes a Braque Francais-Pyrenees desirable is their fluid efficient stride. That along with their smaller stature allows them to cover a lot of ground over long periods of time without becoming exhausted. Their extraordinary sense of smell, natural retrieving instincts and their superior intelligence allows them to be trained quickly & easily. The Braque is known for his soft mouth and is a natural in the field. He is an excellent tracker and hunting dog, a good retriever and a hard worker. 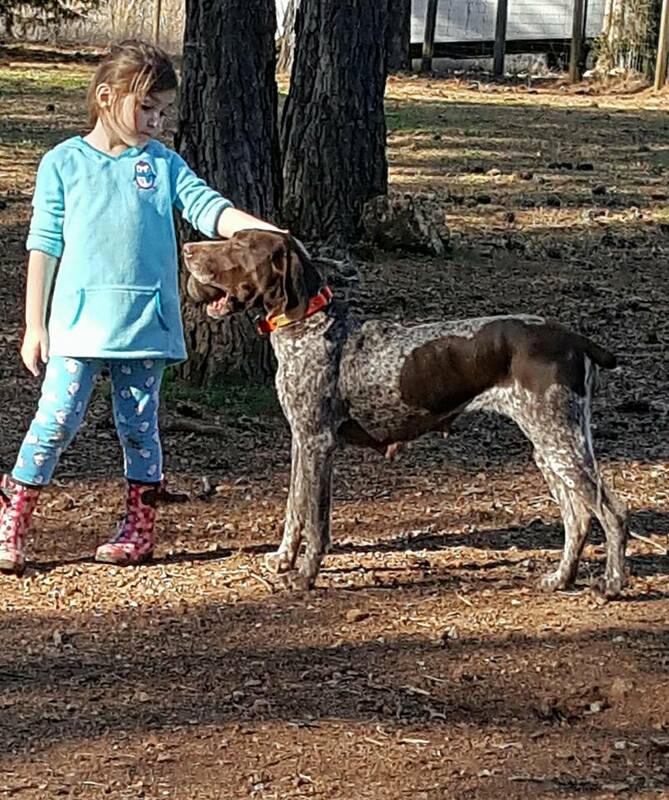 The Braque Francais is not just a pointer, but is a versatile hunting dog that can retrieve, flush, and even trail game in all sorts of terrain. The Pyrenees’ reduced size gives us an animated, nimble and quick moving dog that is a pleasure to watch. The breed’s sensitivity demands care in training. This is perhaps the primary difference between the Braque Francais and the other pointing dogs. The breed responds better to a “soft hand” approach than to strict discipline. The breed is ideal for the rookie handler who has never owned a gun dog. They develop into satisfactory hunting companions without elaborate training beyond a few basic commands, dummy retrieving and exposure to bird scent. They learn well through simple absorption of field experience. Some say the breed is “born half trained.” Braque's mature earlier than other breeds. These dogs were not brought to such early maturity through accelerated training programs, but through gentle encouragement of their natural responsiveness. This breed combines the best attributes of many other breeds into one dog–convenient coat, compact size, calm and biddable temperament, natural ability, enthusiasm for water, early maturity and versatility. No specific diseases or claims of genetic or congenital extraordinary health deficiencies have been documented for this breed. Thus far the breed has enjoyed relative freedom from common health defects found prevalent in other breeds. Hip dysplasia and eye defects are quite uncommon. The Braque Francais is recognized by nearly every registry except AKC. Some of the breed’s long time fans and breeders prefer it that way. There is no such thing as a “bench Braque”–all Braques are field Braques.